The influence of cryorolling and post-deformation annealing on the tensile and fracture behaviour of aluminium–lithium (Al 8090) alloy is reported in the present investigation. The solution-treated (ST) alloy was cryorolled (CR) up to the true strain of 2.3 to achieve ultrafine-grained (UFG) microstructure and then annealed at different temperature ranging from 100 to 350 °C. CR samples showed a significant increase in tensile strength (~ 373 MPa), hardness (~ 120 HV), and fracture toughness [KQ (21.9 MPa \( \surd m \)), Kee [27.9 MPa \( \surd m \)), J integral (21.8 kJ/m2)], while huge drop in ductility of CR alloy is observed as compared to coarser grain ST alloy. After annealing in the temperature ranging from 100 to 350 °C, the significant changes in the tensile and fracture behaviour of bulk UFG Al 8090 alloy were noticed. The tensile strength and fracture toughness were gradually improved up to the temperature 150 °C and observed to be maximum (~ 561 MPa) at 150 °C, while beyond this temperature, a significant drop in these properties was observed. The improved tensile and fracture properties of cryorolled followed by annealed alloy at 150 °C could be attributed to the precipitation of S′ (Al2CuMg) and \( \delta \) (Al3Li) phase as observed from XRD and TEM studies. Alhamidi A, and Horita Z, Grain Refinement and High Strain Rate Superplasticity in Alumunium 2024 Alloy Processed by High-Pressure Torsion, Elsevier (2015). https://doi.org/10.1016/j.msea.2014.11.009. Rajinikanth V, Arora G, Narasaiah N, and Venkateswarlu K, Mater Lett 62 (2008) 301. https://doi.org/10.1016/j.matlet.2007.05.014. Rao P N, Singh D, Jayaganthan R, Rao P N, Singh D, and Jayaganthan R, Mater Sci Technol 0836 (2013). https://doi.org/10.1179/1743284712y.0000000041. Joshi A, Yogeshak K, and Jayaganthan R, Mater Charact (2017) 253–271. https://doi.org/10.1016/j.matchar.2017.02.003. 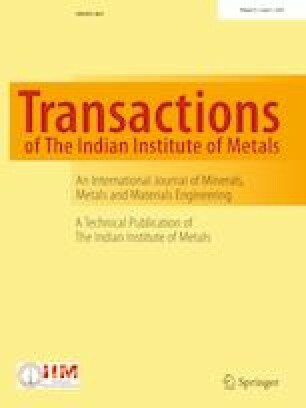 Singh D, Rao P N, and Jayaganthan R, Int J Miner Metall Mater, 20 (2013) 759–769. https://doi.org/10.1007/s12613-013-0794-4. Rangaraju N, Raghuram T, Krishna B V, Rao K P, and Venugopal P, Mater Sci Eng A (2005). https://doi.org/10.1016/j.msea.2005.03.026. Krishna K S V B R, Chandra Sekhar K, Tejas R, Naga Krishna N, Sivaprasad K, Narayanasamy R, and Venkateswarlu K, Mater Des 67 (2015) 107. https://doi.org/10.1016/j.matdes.2014.11.022. Prasad N E, Gokhale A A, and Wanhill R J H, Butterworth Heinemann. (2014) 1289. https://doi.org/10.1201/9780203912607. Llorca Isern N, Gonzalez P A, Luis Pérez C J, and Laborde I, Mater Sci Forum 503–504 (2006) 871. doi:10.4028/www.scientific.net/MSF.503-504.871. Dhal A, Panigrahi S K, and Shunmugam M S, Mater Sci Eng A 645 (2015) 383. https://doi.org/10.1016/j.msea.2015.08.020. B. Farahmand, and M. Aliabadi, Fracture Mechanics of Metals, Composites, Welds, and Bolted Joints: Application of LEFM, EPFM, and FMDM Theory (2002). https://doi.org/10.1115/1.1483354. Joshi A, Kumar N, Yogesha K K, Jayaganthan R, and Nath S K, J Mater Eng Perform 25 (2016) 3031. https://doi.org/10.1007/s11665-016-2126-0.